By now you have probably become wise enough not to reply to that email from the African prince who wants to transfer millions to your account, or to the mail telling you you’ve won the lottery you’ve never bought a ticket for, but would you help out an Irish couple in need? 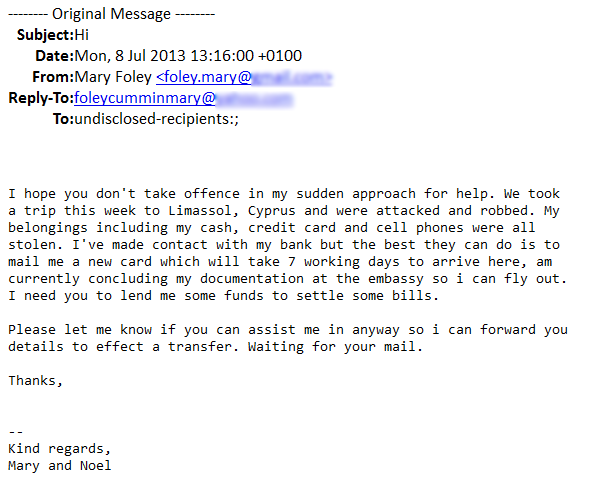 This sort of “stranded abroad” scam has been around for a while, and because at first the “friend in need” was usually stuck in London, it even acquired the name “londoning”. But, as the cybercriminals have learned that people respond better to things they’re familiar with, they now tend to customise each scam, to target specific countries and victims there. Sometimes, when someone’s email account is hijacked, their friends might also receive such emails, with actual info of their friend included, which makes it even harder to spot it’s actually someone else taking advantage of people willing to help. ESET Ireland suggests you ignore such requests from anyone you don’t know, while if it comes from someone you do know, phone them to check if they’re actually in trouble or to warn them someone is using their name and email to scam people.